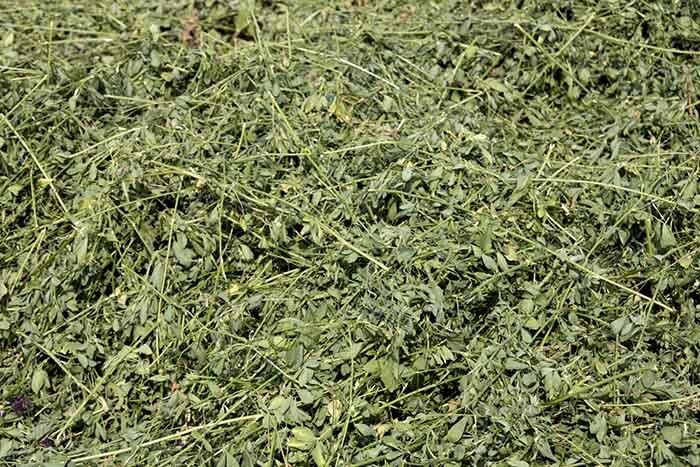 The primary goal of any alfalfa grower should be to harvest as many leaves as possible. The ones left on the ground after the baler or chopper exits the field become fertilizer, but they won’t translate into much milk or meat. The following are simple steps to maintain leaves. In the humid environment of the eastern U.S. leaves can be lost to fungal diseases. Choose good varieties. Also, fungicides have been shown to help maintain leaves, but the response has been variable. Mow into wide swaths to ensure faster and more uniform drying. Check the ground under the swaths or windrows following mowing and conditioning. There should be minimal leaf loss at this stage, though flail-type conditioners are prone to more leaf loss than roller types. Every time forage is moved between cutting and baling more leaf loss occurs; the wetter the forage, the less the leaf loss. Minimize the amount hay is moved in the field (rake to center rather than one side). Mergers result in less leaf loss. During harvest, maximize windrow size to the capacity of the baler or chopper. Larger windrows result in less leaf loss at the pickup. Bale at the proper moisture. Forage that is too dry will result in excessive leaf loss and poorer forage quality.